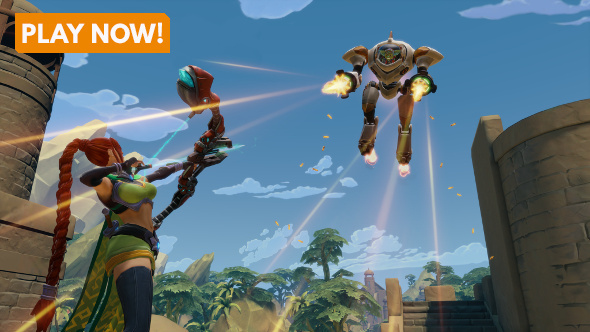 Paladins is a free-to-play, team-based shooter that offers deep strategy elements and in-match character progression. And if you enjoy the fast-paced action of Overwatch, then there’s a good chance you like Paladins too – even though they’re definitely not the same. Want to jump in? You can play Paladins for free right now. This guide outlines champions and their classes, offer knowledge on deck building, and provides general gameplay tips to help you wreak havoc on the battlefield. These champions are good at holding the line and protecting their teammates from otherwise lethal attacks. Their abilities offer barricades and shields and have high amounts of health and defensive abilities which allows them to sponge enemy shots. Tanks are great at holding key capture points and offer their teammates opportunities to infiltrate the zone while enemy players try to break their defensive wall. The primary purpose of this role is to bring the hurt on enemies, especially squishy champions. Their abilities revolve around knocking enemies in the air, stunning targets, and teleporting to specific locations. These skills allow damage dealers to disrupt their opponent’s movements and stop them dead in their tracks. Supports are the backbone of the team and keep their allies healthy with their healing abilities. They can slow enemy movements, deal AoE damage and escape otherwise lethal attacks. Pair a support with a front line tank to allow your team to effectively capture zones while minimizing incoming damage. A flanker’s job is to blast their way through the enemy’s backline and take out their damage dealers. This allows the front line to easily capture objectives without having to worry about incoming damage that would otherwise hinder their progression. All flankers are equipped with high mobility and escape mechanisms to ensure they survive flanking and rushing their targets. 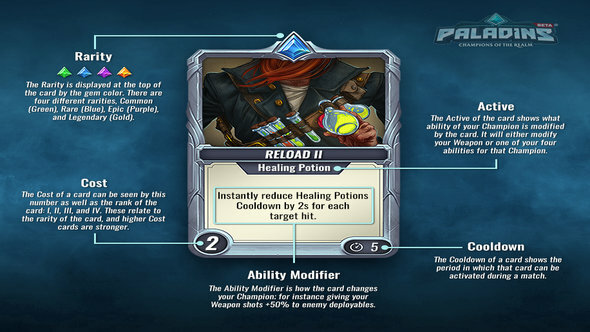 Paladins’ deck-building system is where the game differentiates itself from other hero-based shooters. Cards can be obtained either by crafting them with gold and crystals or by opening in-game chests. You can keep track of your current cards by looking under the Champions tab and equip them using the loadouts menu. Decks are made up of five cards and work on a point system, with each card having a specific points value attached to it. Rarer cards are stronger, but take up more points to compensate for the buff they give. Deck management is key, as each deck can only hold a maximum of 12 points and must consist of five cards. Cards lend themselves to playstyle variation when taking on a particular role and give champions buffs to their overall damage, speed, shielding capabilities, etc. For example, if you decided to pick up Ying for her healing abilities but feel she could benefit from added damage you would prioritise cards that buff her overall damage output. The cards wouldn’t change her role as a support, but it would give her access to the damage she would otherwise lack. While certain cards may beef up abilities they can also have detrimental effects. Adding extra damage to a tanky champion can end up leaving them significantly weaker in their defensive capabilities and make them easy pickings for opponents. Make sure you read the description of all the cards and don’t be afraid to play around with your options. Find a deck that compliments your playstyle and learn when and where to use certain builds to your advantage. 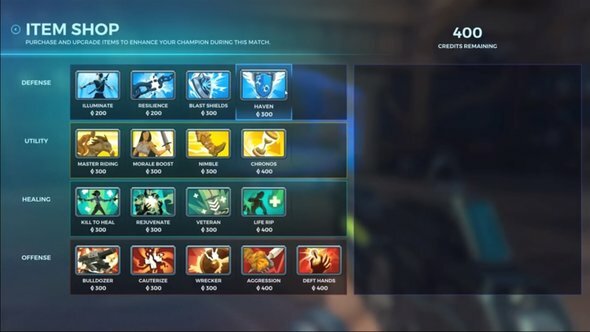 Paladins doesn’t let you switch your champion in-game, instead you use burn cards that can assist with things like reducing the enemy’s ability to heal, increasing your movement speed, giving you added damage when attacking shields, etc. All burn cards are separated into four types: attack, defence, healing, and utility. The burn cards last through death and expire after the round finishes. A maximum of three burn cards can be purchased at the start of each match by using the credits you accumulate while playing. However, only one card from each group can be purchased, but you can stack one card and upgrade its particular effect up to three times. So choose wisely and be sure to cover your champion’s weaknesses. 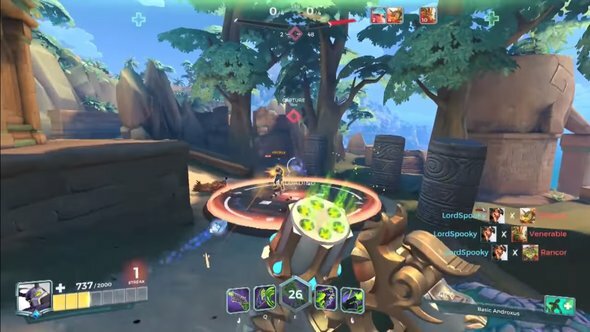 There are currently two main game modes within Paladins – Siege and Payload – both of which pit two teams of five champions against each other. In Siege the objective is to get to nine points before the opposing team does. Once a team has captured an objective they will be granted two points and a payload cart will spawn. The cart will need to be pushed to the enemy’s base and the attackers will receive another two points. If the opposing team manage to prevent the enemy push they receive one point. The game continues until the maximum objective points have been gained and the winning team will be declared the overall victor. Payload is exactly the same as Siege, except there are no capture points, simply an attacking and defending team. As you’d expect, a well-rounded team that synergises well with one another is crucial. There’s no point having a team full of damage dealers or a team without a support or a tank as the enemy can easily exploit clear weaknesses. Two tanks, a support, a flanker and one damage dealer is a great composition. The tanks provide plenty of defence and safety, the support keeps everyone healthy, while waving a flanker who can put pressure behind enemy lines makes it easier for the damage dealer to do their thing. 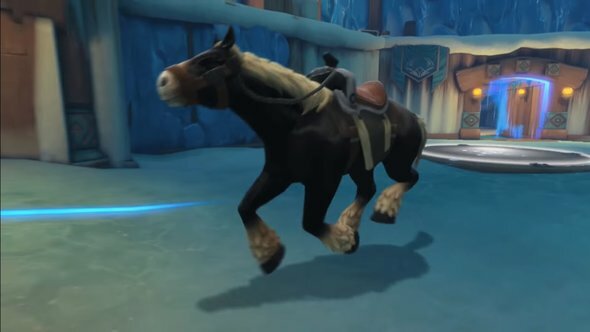 Be sure to hop onto your mount to increase your speed and ability to get back to the action. This will save you a trek and allow you to support your team that much quicker. However, taking damage while on your mount will dismount you and, once in combat, you cannot mount until you have either killed the enemy or fallen in combat. 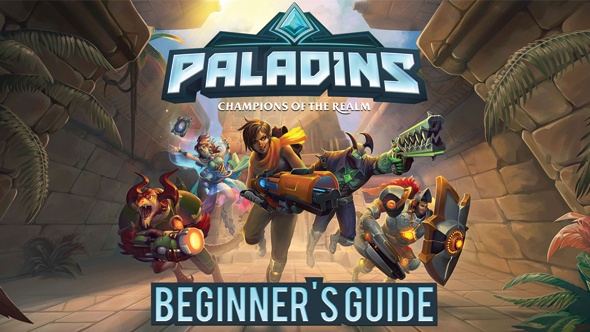 Paladins features a handy Voice Guided System (VGS), which allows you to quickly access a library of preset voice commands without having to type in chat. As ever in games like this, it’s important to let your team know when your ultimate is up, as well as keeping track of enemy positions and notifying your bros when you see a good opportunity to attack or capture an objective. Congratulations, you are now a Paladins master. Or if you’re not, get started playing Paladins for free right now so you can become one.